Frank Sinatra claimed he had waited 20 years to work with the legendary Count Basie and his orchestra and, in 1962, he finally got his chance with Sinatra-Basie: An Historic Musical First. 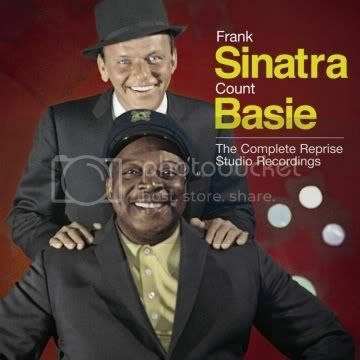 Frank Sinatra claimed he had waited 20 years to work with the legendary Count Basie and his orchestra and, in 1962, he finally got his chance with Sinatra-Basie: An Historic Musical First. The pairing of these two New Jersey natives was so successful that they worked together again on 1964's It Might As Well Be Swing. Now both of these legendary recordings are available on the newly remixed and remastered Frank Sinatra & Count Basie — The Complete Reprise Studio Recordings. The songs are presented in their original running order and the collection leads off with a swinging "Pennies From Heaven." Basie's playful piano intro sets up a jubilant Sinatra vocal perfectly with the Chairman taking liberties with the vocal melody, making the song his own. Sinatra revisits "[Love Is] The Tender Trap," a song he originally sang in the 1955 movie of the same name. The track has a laid-back swing feel with Basie's orchestra adding emphasis to Sinatra's vocals. When Sinatra sings, "You string along boy and snap," the brass kicks in like a blast to the face. It's a great contrast to the rest of the song. Throughout the CD, the band has a real kick to it. Snare drums crack and the brass is bold — appropriate for this Rat Pack period of Sinatra's career. Both Sinatra and the band absolutely kill on a blistering "Looking At The World Thru Rose Colored Glasses" that features some incredible sax work from Frank Foster and Eric Dixon while a subdued "I Won't Dance" — a song Sinatra originally recorded on "A Swingin' Affair!" — brings the original album to a close. The It Might As Well Be Swing material begins with one of Sinatra's signature songs, "Fly Me To The Moon (In Other Words)." Arranged by Quincy Jones, the song serves as a tantalizing intro to the album and remains a career highlight for all involved in the song. Sinatra takes a rare stab at a country song with the classic "I Can't Stop Loving You," made famous previously by Ray Charles and later by Elvis Presley while "Hello, Dolly!" becomes a playful ode to the great Louis Armstrong, who recently had a hit with the song, helping to reignite his own career. Another signature song appears in the form of "The Best Is Yet To Come." Sinatra delivers a confident, swaggering vocal on this bluesy track — a favorite of both the performer and his fans alike. Sinatra and Basie performing together was a true meeting of musical giants. People often throw out the term super group, but this truly was. These two studio albums are a high watermark in each artist's career and make Frank Sinatra & Count Basie — The Complete Reprise Studio Recordings a must-own CD.